While you may be familiar with testing for visual acuity, inspecting vision quality is just one part of a complete eye assessment. At Vaske Vision Care in Parker, CO, we will check all aspects of your ocular condition to provide top-notch care. From infants to seniors, a regular and total eye exam is important. Along with verifying your vision prescription, Dr. Michael Vaske will assess your eyes closely and skillfully for any signs of disease. Serving Colorado’s Douglas County, our office is fully furnished with all the latest diagnostic tools for examining the health of your eyes. A range of procedures and tests are used to inspect your vision and retinal structures, including basic eye charts, high powered lenses and digital imagery. How often do adults need a complete eye exam? According to eye care experts, all adults should have a comprehensive eye evaluation every one to three years. If you wear eyeglasses or contacts, the American Optometric Association (AOA) advises annual examinations. After age 40, eye doctors generally instruct patients to be extra-vigilant about eye exams every one to two years, in order to detect age-related eye problems as early as possible. Common ocular conditions include presbyopia, macular degeneration and cataracts. Specific health conditions, such as hypertension and diabetes are another reason to schedule more frequent comprehensive eye examinations. The exact frequency that you need your eye health assessed depends upon your age, physical condition and specific risk factors. After a personal consultation with you, Dr. Vaske will instruct you regarding what’s recommended for your individual situation. After age 60, your risk of eye disease increases and you should come in for a yearly evaluation. How often do children need a complete eye exam? 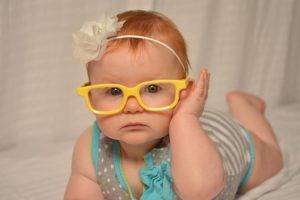 All kids, according to the AOA, should have their first eye exam at a half year old. This should be followed by ocular evaluations at age 3, and then prior to the start of school. Children without existing vision problems are advised to have their eyes checked at least every two years, and kids with eyeglasses or lenses should undergo evaluations more frequently. Certain risk factors also indicate a need for more regular eye exams. Statistics declare that about 5% to 10% of preschoolers and 25% of school-aged children have vision problems! Difficulties with eyesight can compromise development and cause learning delays. Routine pediatric exams are therefore extremely critical during school years. Our eye doctor, Dr. Vaske, will inspect your child’s eyes and provide guidelines for scheduling future pediatric exams. What are risk factors for pediatric vision problems? The presence of any of these factors will often determine a need for more frequent pediatric eye exams. Be sure to mention any of the above when discussing your child’s case history with Dr. Vaske. 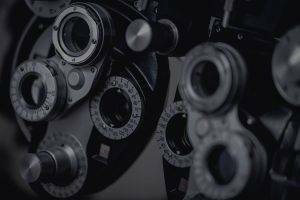 Do You Need an Eye Exam in Parker, CO? Vaske Vision Care, located in the Walmart Supercenter in Parker, CO, offers a full range of ocular services. During a complete eye examination, Dr. Vaske will determine your prescription for glasses or contact lenses, and will also check your eyes for common eye disorders.